Some dregs of Christmas last a long, long time, but who wants a taste of the festive season while Spring’s in full swing? With all the sunshine bouncing about, it’s time for a tart. Stilton: sufficiently patriotic for a royal wedding; walnuts: perfect nibbling for a long, long weekend. So here’s my Stilton and celery tart in walnut pastry, made of yuletide leftovers dredged from the depths of the freezer, with a savoury spring in its step. Talk about resurrection…. Grind the walnuts finely on the pulse setting of your food processor; add the flour with a pinch of salt and pulse to combine. Add the butter, pulse again until the mixture looks like fine breadcrumbs, then add the egg incrementally through the funnel, pulsing gently all the while. As soon as the mixture looks like it’s starting to come together, stop! If it doesn’t, add a tablespoon of cold water, then check again: it will. Turn out the mix onto a floured surface and roll out gently or press it together with your fingers, then use it to line a 23cm loose-bottomed tart tin to about the thickness of a pound coin. Cut away the excess but don’t trim the edges yet, place it on an oven tray (you don’t want the bottom falling out) then cover with a plastic bag (or cling film if you must) and refrigerate 30 minutes or so. This will let the pastry “rest” as the flour absorbs the fat and moisture. I think we all know by now that it will shrink dismally in the oven if you omit this step. Bake blind at 190C/Gas 5 for 15-20 minutes until the edges are starting to colour, remove baking beans* and prick bottom all over with a fork then return to the oven for a further 5 – 10 minutes until that looks nicely cooked through. Remove from the oven and, once it has cooled enough just enough to handle, trim the pastry edge level with the top of the tin. Reduce oven temperature to 180C /Gas 4. Melt the butter in a sauté pan and fry the leeks and celery with a good grinding of black pepper – and a whisper of freshly grated nutmeg if you like such things – gently until softened, but still with a bit of texture. Cool slightly then sprinkle across the base of the tart case. Crumble the Stilton evenly over the vegetables. Stir the dairy liquid into the egg yolks to amalgamate, then pour over the Stilton and vegetables. Gently transfer the tart into the oven – middle shelf – to bake 30 minutes approximately; the second the centre stops wobbling take it out to cool. Serve a green salad with a sharp dressing on the side. 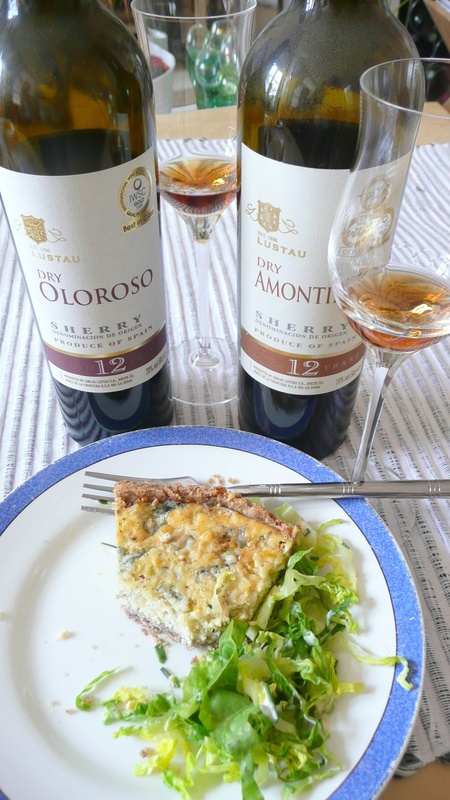 Incidentally, liquid legacies from last December, Sainsbury’s TTD Dry Amontillado and Oloroso sherries, made an auspiciously deliciously happy marriage with these punchy flavours. *my baking beans have gone awol so I substituted with glass nuggets (the kind used in floristry), which seemed to work just as well. And what a terrific deal: we descended as a pair of locusts intent of bankrupting Rowley Leigh by our greed but, on finding ourselves defeated by the gentlemanly generosity of his portioning, declined dessert. 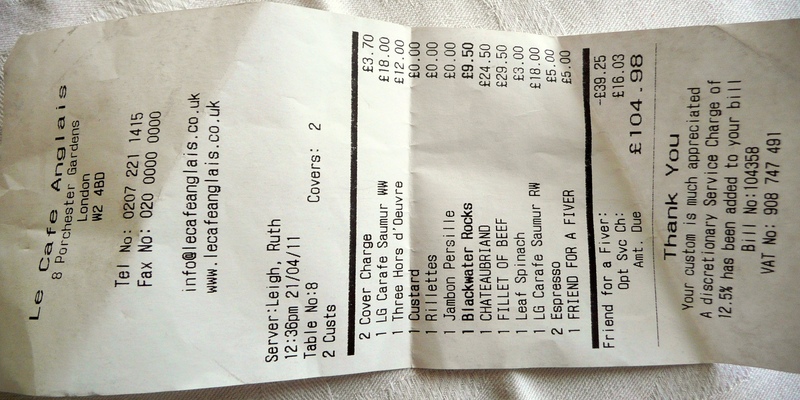 A cover charge, wine, coffee and service boosted the bill considerably, but every penny was worth the spend. What a thrill to sip chilled Saumur (blanc et rouge), over a sunny spring luncheon in such stunning surroundings: a total treat. No pix though; I’ve become a bit squeamish about photo-ing food in public and there are plenty already online… suffice to say the icy oysters could not have been fresher, a holy trio of hors d’oeuvres lived up to their legendary status, the St. George’s mushrooms were an earthly delight, the salsify cooked to perfection – yes, every complimentary cliché about this place is true. And as far as I’m concerned, no photo could do justice to the majesty of the art deco architectonics either. I recommend you go and enjoy. Talk about putting a spring in our step; we spent the rest of the afternoon strolling across the western edge of Hyde Park, admiring the view from the upper deck of a Number 9 bus before winding our way across Soho and Covent Garden to Charing Cross and then home. Well, with the stunning weekend weather I think we all felt a bit resurrected by Easter Monday; fit and ready for fresh somethings – anythings after the long winter hibernation. But, having forgotten to go to the farmers’ market on Saturday our only “fresh” fixings were frozen peas. What? Ok, frozen peas: they’re “fresher” than fresh peas, so there. What was at first a disappointment and a waste of ingredients I transformed into something that blew us all away, hooray: fresh herbs and fresh ricotta can take you a long, long way. Sweat the leeks in the butter until soft, about 10 minutes. Add lettuce and peas, turn to coat in butter and soften gently under a lid for 5 minutes-odd. Add the vegetable stock, bring to a boil then cover and simmer until the peas are tender – about 10 minutes. Blend, adding lovage leaves gingerly, tasting all the while. If, like me, you have a not-very-good hand blender it won’t do a great job and your soup will never attain the desired smoothness. I kept going to no avail, so eventually decided to sieve it. This produced a fine-flavoured thin soup and a mountain of debris – far too much to waste indeed, hence the bruschetta. 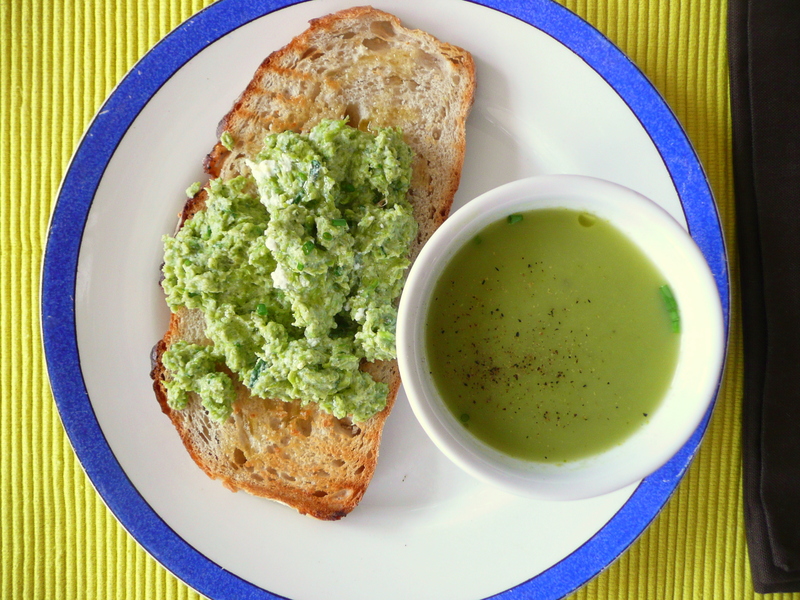 Stir together the pea solids and ricotta, add the herbs to taste and season. Grill the bread on both sides, and once lightly toasted, rub the garlic clove over the surface, as when making Pa Amb Oli (minus the tomato, natch). 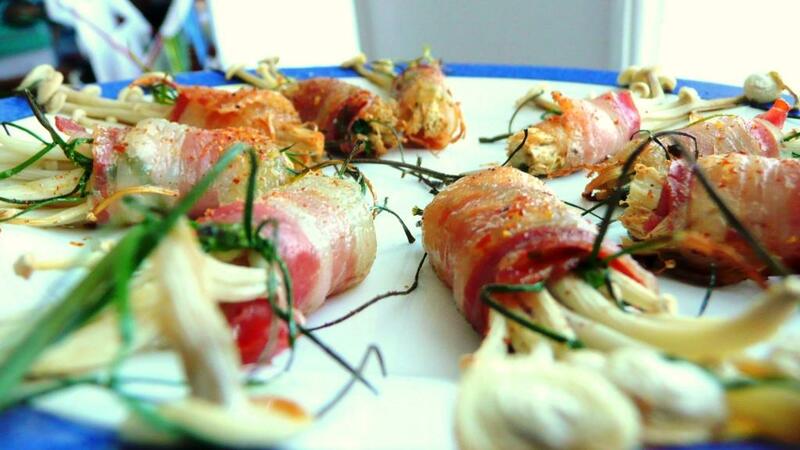 Top with the pea and ricotta mixture, apply the drizzle of oil and sprinkle with the scatter of herbs. Serve the soup in small cups alongside the bruschetta. ps – I can report that the soup tastes just as good, if not better, chilled the next day – perfect for the hot weather of late. 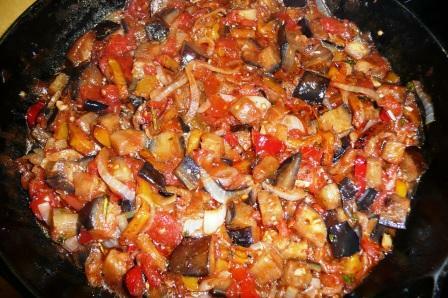 Somewhere between ratatouille and caponata lies the Spanish Pisto Manchego, (pedestrian translation: slow cooked summer vegetables) cooked without hurrying to a lambent jamminess, in contrast to the toothsome integrity of each separately sauteed vegetable in a Provençal ratatoille nicoise or the pickle-icious unctuousness of the small dice caponata. 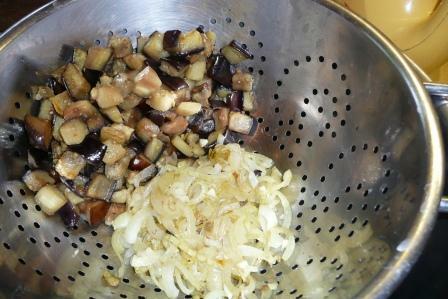 The essential ingredients are the aubergine, the garlic and the olive oil – everything else is negotiable. I don’t do stir-fry, which puts 90% of recipe suggestions out of the question, I don’t subscribe to that (largely north american) practice of throwing a number of costly ingredients together in a bowl and calling it a salad, and neither am I keen on mushrooms in their raw state; options diminishing by the nano-second. 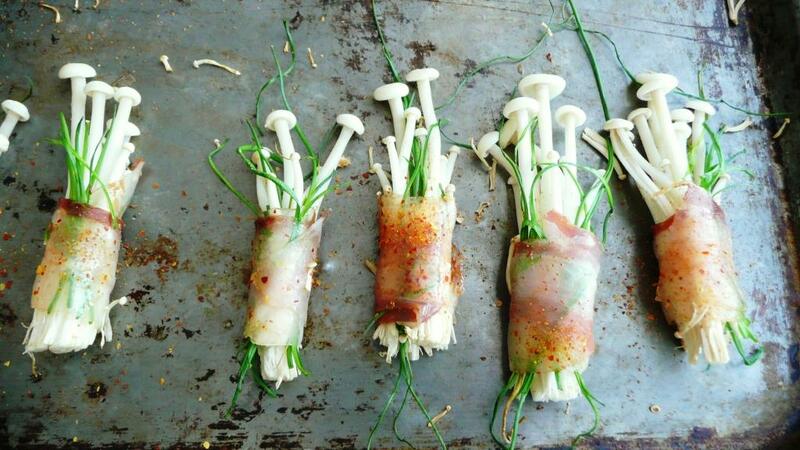 But I dislike wasting food more than anything: time to get my imagination into gear. Inspiration wafted up from the pages of Lorenza’s Antipasti. This fab charity shop find delivers masses of recipes but also, and what I love most of all in any decent cookbook, interesting and informative introductions to its several sections: lots of text! It’s beautifully organised: Part I is a pair of essays, Types of Antipasti and The Antipasto Pantry, while Parts II and III are Finger Food and Fork Food respectively, both sub-divided, and Part IV is Preserves and Basics. 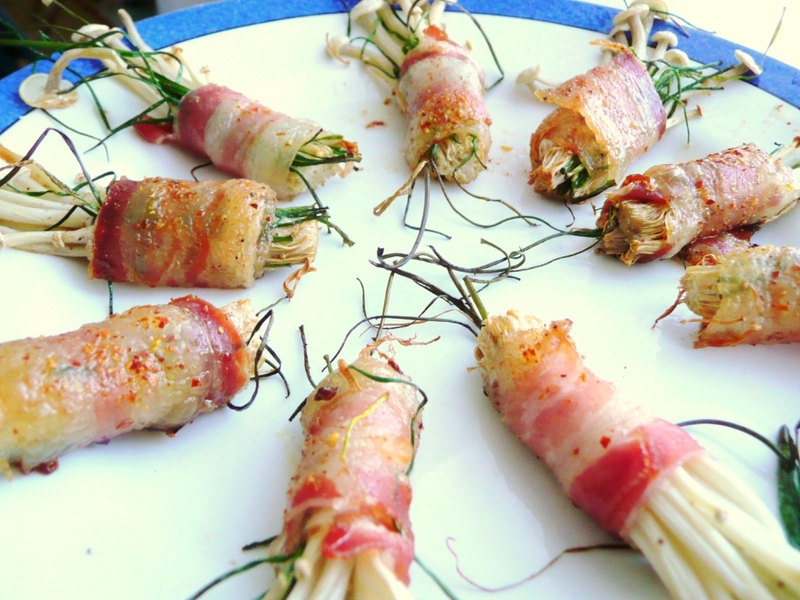 I used the method for rotolini – or involtini – and wrapped a few enoki with chives in half-slices of pancetta and baked them for about 15 minutes at Gas 4-ish (375F, 190C, moderate-to-hot) to crisp: simple, genius! I’ll try anything twice but this time just the once will do fine. 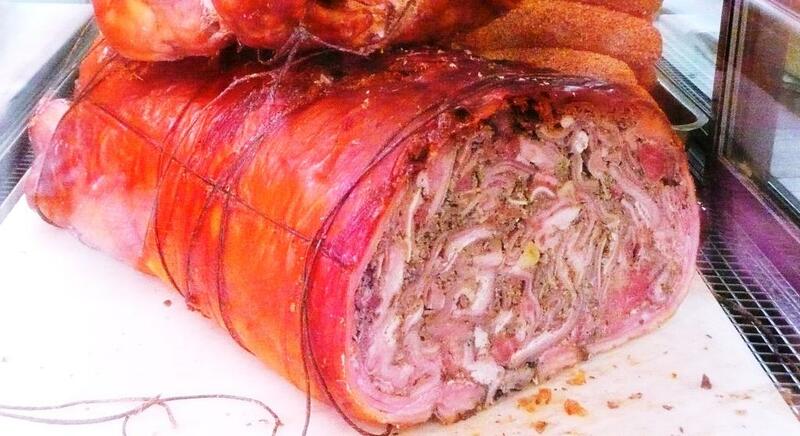 Porchetta is one of those authentic specialities of la cuisine niçoise I would have loved to love but it just aint gonna happen. 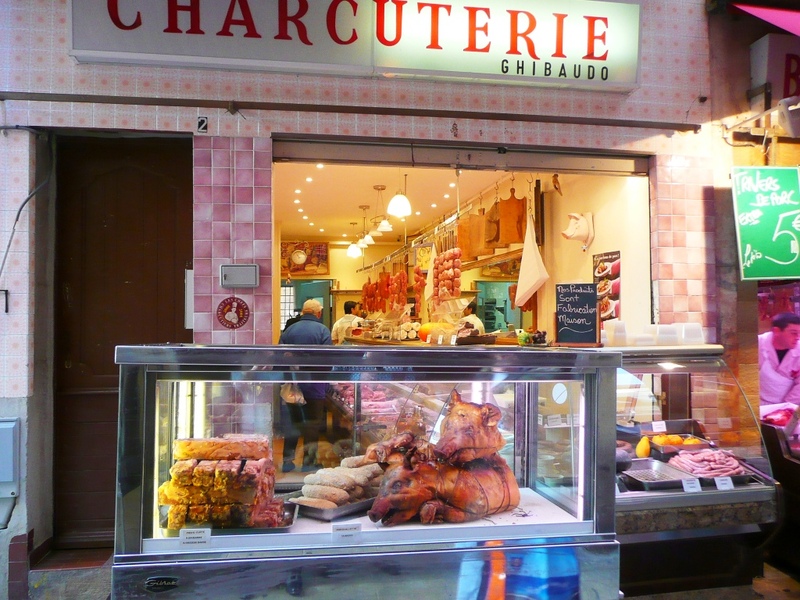 We’d been gazing in awed fear and longing for far too long at the petrifying porcine carcasses in their glass coffins outside the charcuterie shops along rue Pairolière in Vieux Nice; now was the time to bite the bullet and actually buy a slice. Thank heavens Madame at Charcuterie Ghibaudo was kind enough to offer a demi-tranche as this stuff is not cheap at near-enough €20 a kilo. As it was, our package weighed a good 400g. 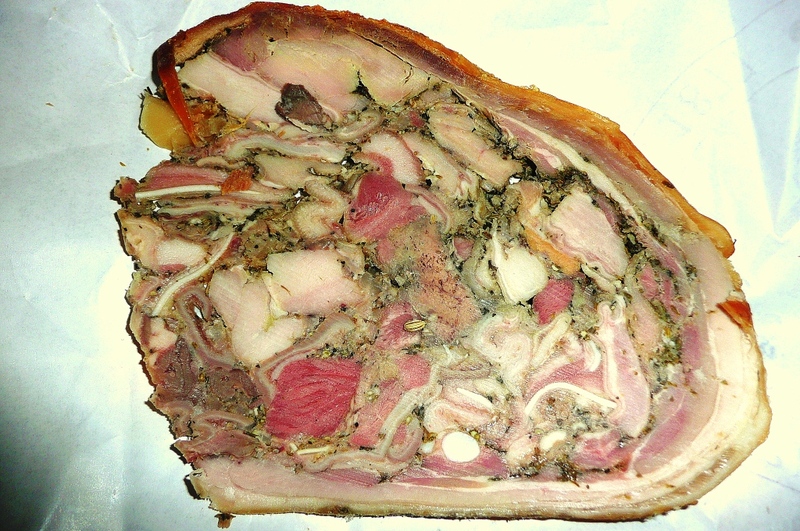 Not a lot of mystery there, as it turns out: it’s everything that was originally in the piglet, chopped up and mixed together with a few herbs, garlic, a little seasoning, then stuffed right back in. And when I say everything I mean everything, that brilliant white circle at bottom centre of the slice is a piece of bone, the pale wiggly bits are intestine and the pinky-white chunks are hunks of fat. The T-zer and I felt like Jack Sprat and spouse trying to enjoy this curate’s egg: he quavers at the taste of offal, which I rather enjoy, while I tremble at the texture of anything too chewy. 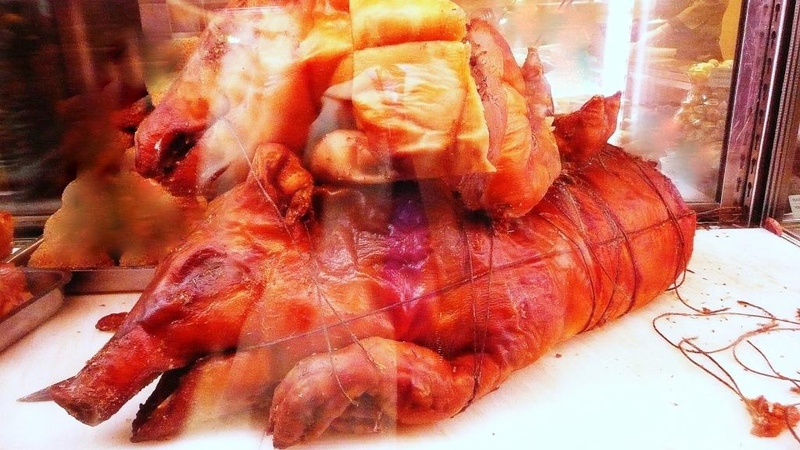 Not a hit chez nous, but you may find the idea delightful and, failing a trip to Nice to taste the real thing, here is a recipe (in French) for making your very own Porchetta Niçoise. 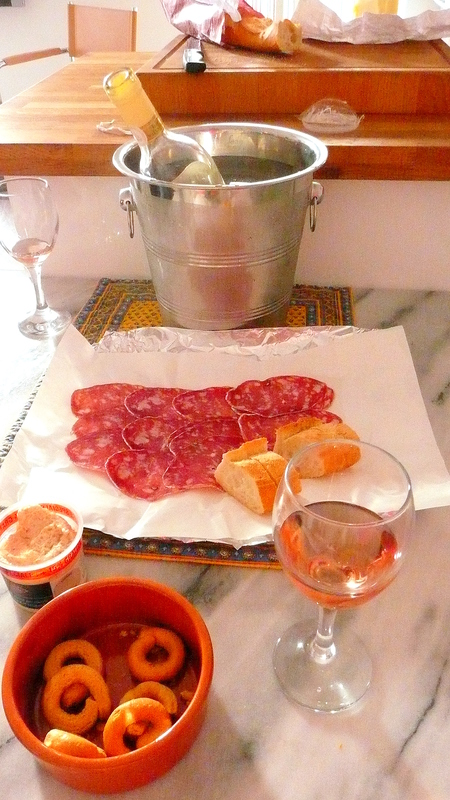 Not much going on here, just the fixings for a lazy afternoon at our home from home in Vieux Nice: what more could you need than a chilled bottle of Côtes de Provence rosé, a package of freshly sliced finocchiona (fennel salami), crunchy taralli with chili, baguette still-warm from its wood oven, a block of freshly churned butter and a wee pot of taramasalata, all picked up during the course of a leisurely shopping stroll around the old town streets? Well, I can tell you, a copy of Nice Matin to read on the balcony, that’s what.